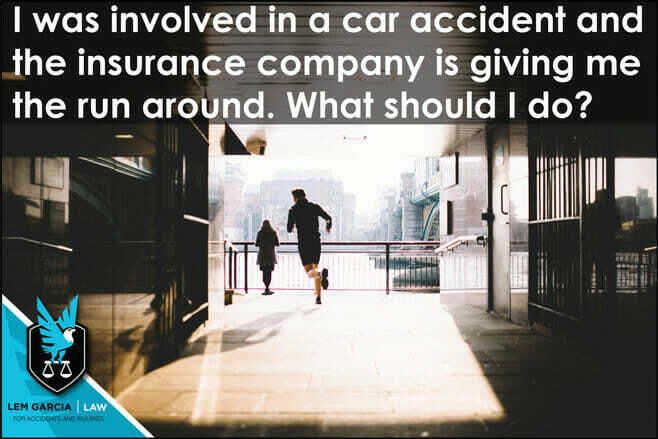 It is very common for people who have been involved in a car accident to feel like the insurance companies are giving them the run around. If you find yourself in this position, it is important that you speak to an experienced personal injury lawyer as soon as possible. A personal injury attorney will be able to advise you what you can do yourself or will be able to represent you and do an excellent job for your particular case. Every case is different, but generally speaking, if you are unable to get a straight answer from the insurance company or you are unable to speak to them directly, a personal injury lawyer should be able to help you – especially if you have been injured. Many personal injury attorneys will be able to take your case if you have been injured in a crash and you were not at fault for the collision. If you were not injured in the crash, some lawyers will be able to help you with the property damage portion for your claim, or at least provide you with guidance about what to do and how to handle the insurance company. If you are not interested hiring an attorney for your case, you will have to deal with the insurance company on your own, and there are too many situation for the insurance company to take advantage of you. Remember, insurance companies handle car accident claims all day long and the insurance adjuster’s job is to reduce the value of your case or in the alternative deny the claim entirely. Even your own insurance company and insurance adjuster is not on your side. The insurance adjuster advocates for the insurance company, and you do not have anyone advocating for you unless you have attorney. We recommend that you at least speak to a personal injury attorney before attempting to handle your case on your own. As stated previous, a personal injury lawyer will be able to provide you with some tips and pitfalls to avoid when dealing with the insurance company on your won. West Covina car accident attorney, Lem Garcia, provides free case consultations and his happy to guide people in the right direction if they are only looking for legal information. We are here to make sure that you do not get taken advantage of by the insurance company. Call us anytime if you would like us to handle your case or if you are just looking for some information.